Pull thru the gates 'unplug' & just relax. We feature 36 new FHU sites, 12 big pull thrus 75X100'. Sits between two lakes, fish, kayak, paddle board or sit back & enjoy the view. Five 2 bedroom suites, 70+ channel Cable TV. Fully furnished unique lodge style, air conditioned with fireplace and access to all of parks amenities. Great facility. Staff was friendly. If you like to fish this is the place to stay. Can't wait to go back. Very nice campground. Concrete pads for the big rigs. Nice pool and store. However, the campground has a major infestation of ANTS. Took three days to kill off all of them that invaded our rig. Needless to say, won't be staying there again in the near future. On first appearance, the campground is very nice. However, we were covered with ants within the first 2 to 3 hours we were there. Were told in the camp store that they were having "some trouble" with ants, and we could buy spray on site at the same price as the closest Walmart. We had no idea that by the next morning our RV would be covered by ants, both inside and out, even areas where no food was stored. We bought spray at Walmart for about 1/2 price of what the campground offered. We never saw the campground spraying the entire time we were there. We spoke with several other campers who were also infested. The campground staff was very rude when confronted about the ant problem, and indicated that it was not their problem and spraying was left up to each camper. Staff was also rude in regard to parking in the fishing pier area and made us move our vehicle back to our own campsite at the far end of the campground. There is no garbage pickup or pet waste containers. Dumpsters are located near the front gate, quite a walk for elderly campers. We left early because even after spraying, we could not keep the ants from coming back to our site and sitting outside at our site was out of the question due to the ant problem. If the campground had tried to eradicate the ant problem, we might have stayed, but several campers left early, as we did, because of the non-concern of the campground staff. This was our second time at Twin Lakes and loved it. The resort is well maintained and the sites concrete pads and large enough that you don't feel as if you are on top of your neighbor. The views is beautiful and it is far enough away from the main road the it is quiet. The only issue and the reason it has a 4 star rating and not 5 are the ants. When you check in they let you know about them but the are terrible. So be for warned make sure you have plenty of ant repellent! This is one place the pictures do not do it justice. Beautiful, well maintained grounds. Every spot has a view. Pads are concrete and large. Professional staff who seem excited to see you. This is a beautiful park. All current sites have a view of water - even if it is only a small view. It has the look of a new park so we were surprised to find that it's an older park undergoing renovation. The entrance has a coded security gate. New features are being added including some more new sites. All the sites added this year are pull thrus. The restrooms and laundry are immaculate. The restrooms are individual with shower, sink, and commode and have the feeling of luxury. All sites are paved but can be somewhat inaccessible based on angle of entry. The new central pull thru sites have multiple utility so they can be entered from either direction. Unfortunately, our site (a new site) did not have a sewer hookup that we could access and was far from level front to rear. Managers are full-time and onsite and very helpful. 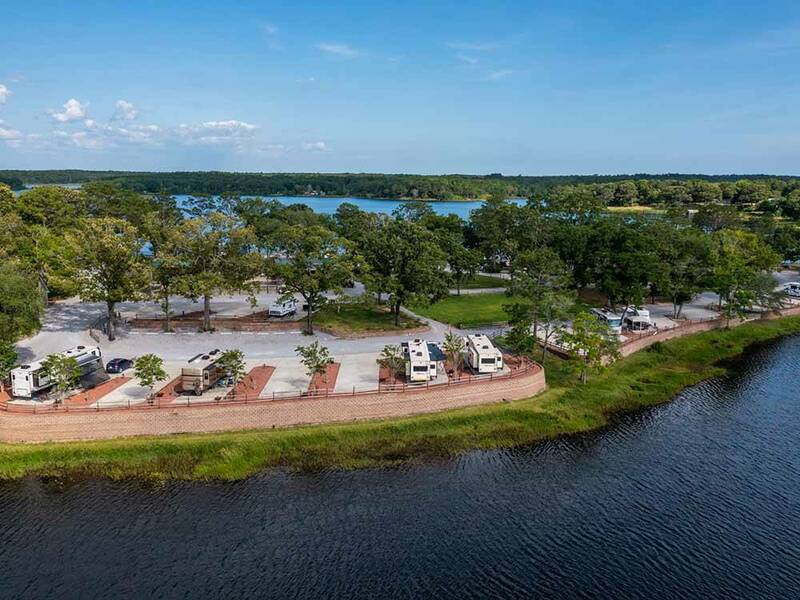 For non-campers, there are cabins for rent.The resort is only a few miles from historic Defuniak Springs as well as a large RV dealership. We would return. Welcomed by friendly managers. Grounds are clean and very well kept. Sites are between 2 lakes. One has sunrises and the other has sunsets. They are still installing a few more sites by the water. Area to walk your dog in. Area for children to play. There is a small camp store. There is a pool, which we did not use. We did not use the bathhouse either. We would stay again if in the area! We just returned from a 3 day stay and can't say enough nice things about this campground and the staff. Being new to camping the staff was helpful in finding us a site that was easy to access. In walking the grounds it looked as if most of the sites had wonderful views of the lakes as we didi. The restrooms are beautiful and kept clean. There are laundry facilities available. There is an outdoor pool that some children were taking full advantage of! All in all we would recommend this property to everyone and can't wait to go back for a longer stay! Still looks like some renovations are going on but what they've done so far looks great. We have been traveling for two months now and this is the cleanest park we have been to. Nice concrete spots. Wifi is very strong. We had a pull thru site and had a wonderful view. The interior roads are very rough, but it is clear that they are making all sorts of improvements to the park, so I am certain they will get those in line as well. My only question or issue was whether we received our good sam discount. I did mention it when we booked, but the receipt didnt reflect the discount. We would definiately stay again. The lakes are beautiful and serene. Interior roads very poor...rattled our teeth. "Security" gate made me nervous...what/who are they keeping out? I can't believe that the owners would spend time/money on improvements and not have level sites. No wifi at our pull through. Disappointing stay. 11 year fulltimers. Beautiful location. Remodel almost complete. As below facilities are top notch. Lake view on 3 sides. You will see your neighbors as in a typical park. This is a small resort only 24 spots or so. Plenty of room between spots so your slides won't touch about 15 feet, but will vary per site. We had no difficulty getting our 35'TT but we had a pull through. Office staff were very helpful and friendly. Fishing piers still awaiting remodel, but are fine. Property is gated. Activity center with pool table and swimming pool. Book early, I'm sure they will stay full. We do have 35 sites open now and 12 more pull-thrus. 25 more coming. Also we have 5 suites open for family and friends without an RV. Thanks for the review. Happy Camping! Beautiful resort. Currently under a top to bottom renovation and what they have completed so far is top-notch (4 bathrooms, laundry room, community room, pool, etc.). All new sites have full hook-ups on both sides of the pad. This makes buddy camping convenient and allows dual use sites. Pads are stamped concrete. The only negative is the RV pad alignment with the access roads. All waterfront sites are near 90 degree/perpendicular to the access road with very little room for maneuvering into those sites. The only sites that are "big rig" friendly are those in a curve of the road where pull-in/back-in is possible. The resort's solution to this are future pull-through sites however none of those are waterfront. This is the only reason for the deduction of one star. Would I stay here again? YES...but the odds of getting a waterfront site with a "big rig" are not good. All sites have decent views though. Twelve 80'-100' pull through are completed. Very big Rig friendly (BTW get a copy of Big Rigs Best Bets for finding great Big Rig friendly RV parks). Thanks for the review, all sites are Back-in/Pull-in with doubled utilities so you can enjoy the view from you best window! A Kayaking and Canoeing dream where fishing is great! Positioned between two pristine lakes with fish jumping out of the water. 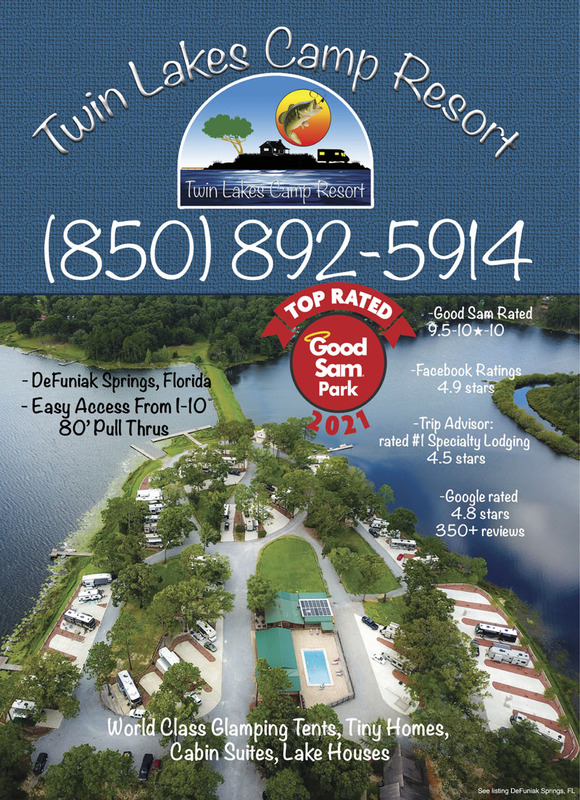 This is a beautiful place to stay & makes Twin Lakes a great experience for the whole family. Come see for yourself what lakeside fun is. Stay exactly the way you like it! This beautiful boutique park is located on a point between two lakes. It offers every option from beautifully appointed lodge rooms, glamping tents or maybe a tiny house experience is right for you. Come see & stay.